Open Sky is now available to purchase. 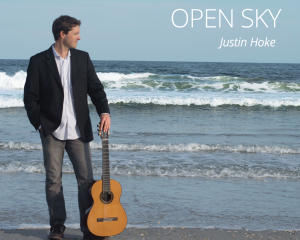 Justin Hoke is an award-winning professional guitarist, vocalist, and teacher located in Wilmington, NC. He holds a Doctorate in Music from Florida State University and is currently on the music faculty at The University of North Carolina Wilmington where he teaches guitar and music theory. Justin maintains a busy performance schedule as a soloist, as a member of the North Carolina Guitar Quartet, and the Cypress Duo. Justin also performs for special events such as wedding ceremonies, parties, and other occasions. Visit his wedding page.